Sometimes the greatest innovations come from fulfilling the most basic needs. It may not seem that way in a time period oversaturated with countless business reports and consumer research studies, but according to Thomas Schlaefer, general manager at Chicago Faucets in Milwaukee, Wis., the fundamentals for customer satisfaction have remained largely unchanged since the company’s founding in 1901. “At the most basic level, customers want value, durability and reliability from a commercial faucet. We got that right in 1913 with the invention of the Quaturn cartridge, and that design has been a core competency in the development of every faucet since. What has changed, though, is how our business must operate to meet customer demand. Globalization has fostered a surge in market competitiveness. As one of only two companies that still casts lead-free brass faucets here in the U.S., we realize that our manufacturing processes needed to be highly adaptive and productive to deliver cost-competitive products with the highest degree of customer satisfaction,” said Schlaefer. Headquartered in Des Plaines, Ill., Chicago Faucets operates out of several facilities throughout the Midwest, including an assembly and distribution facility in Michigan City, Ind. 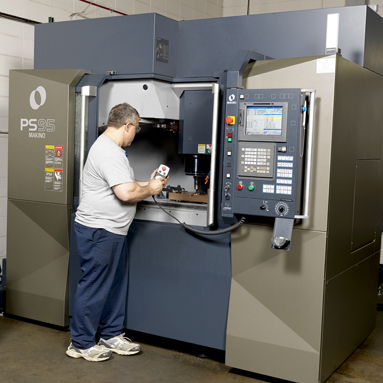 ; a precision turning facility in Elyria, Ohio; and the manufacturing facility in Milwaukee, where Schlaefer and his team are based. It is here that a major shift in manufacturing capability drove company-wide process changes, helping Chicago Faucets promote and enhance the fundamentals of customer satisfaction. Improvements in flexibility and productivity from Chicago Faucets’ first MMC2 led to a faster than expected ROI of under two years. The rigidity and stability of the a51 and a61 horizontals has helped extend tool life by 25 percent while simultaneously reducing cycle times. Since investing in automation, Chicago Faucets has been able to add 90 percent of all part numbers to its MMC2 pools, exceeding its initial goal of 75 to 80 percent. The enhanced spindle power and expanded workzone of the PS95 has enable Chicago Faucets to improve processing speed three fold by taking more aggressive cuts in hard materials and producing both halves of a tool in one setup. Chicago Faucets automated production capabilities help the company react quicker to customer demand, reducing delivery times for some orders from three to five days to less than 24 hours. Investments in automated machining capabilities have had a company-wide influence at Chicago Faucets, leading to the development of a corporate order tracking system that monitors the progress of all orders, from casting to final delivery. Through its efforts to standardize processes across the a51 and a61 cells, Chicago Faucets has been able to reduce its tool variety by over 30 percent with a goal of 50 percent by the end of this year. Like Schlaefer, Chris Schlessinger, Chicago Faucets’ engineer manager, is no stranger to the machine shop. 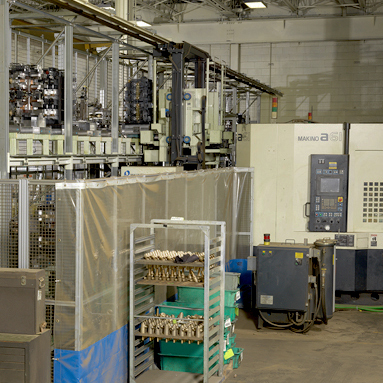 Entering manufacturing at age 16, Schlessinger has now worked in production machining for 26 years. For a time, he thought his knowledge of machine types and styles was pretty thorough. One day, about 10 years ago, all that changed. 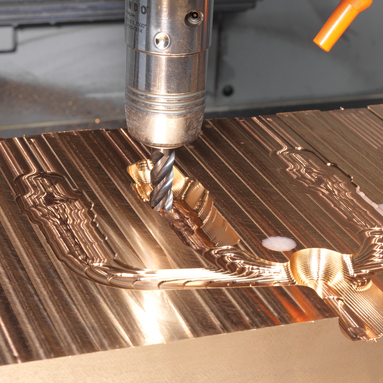 “The first time that I saw an automated machining system, I knew it was a game-changer. The capabilities were clearly beyond what any manual system could achieve. But turning that vision into reality has been a long, challenging process with plenty of obstacles along the way,” Schlessinger said. Like many manufacturers, Chicago Faucets over time found itself increasing competition against products produced in low-labor-cost countries. Its internal processes were typical of that time period—setup intensive, manual equipment that required lead-times of two to three weeks. Low-volume parts could take far longer. Unpredictable customer demand was a constant issue. A shift in product mix or volumes would drive more frequent setups, hurting output and productivity. For the sake of efficiency, the plant attempted to run similar parts back to back, which required only minor tooling changes between these comparable parts rather than a full setup. But this setup added even more restraints to part selection. The plant-modernization process shifted into high gear with the purchase of four horizontal machining centers from Makino. These HMCs significantly improved daily output, mostly by shifting higher volume products off smaller, older machining centers. However, they did not entirely solve the issue of setups. “Technology is driving a real-time, data-driven environment,” said Schlessinger. “In the manufacturing world, this means producing parts just in time. 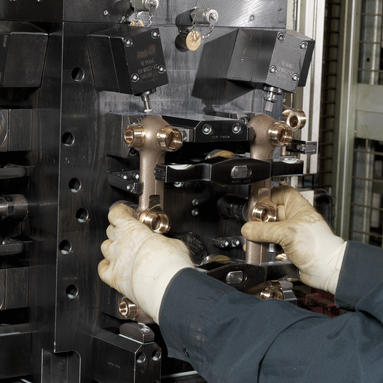 We tried to achieve this on our stand-alone machines, but we were never satisfied with the speed of reaction—we always got caught in the dilemma of needing multiple parts from one machine, while an adjacent machine sat idle or produced low-priority parts. The issue was of critical importance for Chicago Faucets, which has a highly diverse catalogue of products. While all of the company’s castings are created from lead-free brass, the size of casting and machining requirements vary widely. There really was no “standard” part. Determined to create a highly flexible machine shop, the plant leadership team set out to identify a machine tool provider with proven expertise. They worked the list down to three qualified suppliers and ultimately chose Makino, based largely on its all-inclusive approach to flexible manufacturing cells. The Makino Machining Complex (MMC2) pallet-handling system was selected for its strength in high-mix applications, precisely what Chicago Faucets needed to accomplish. Typical of manufacturers, Chicago Faucets requires a three- to four-year payback on factory equipment investments. Despite the struggle to fully “monetize” the benefits of flexibility, the project met the company’s financial requirements through increased machine performance and improved utilization rates. Flexibility, in the end, was largely an unquantified benefit that came along with the rest of the package. 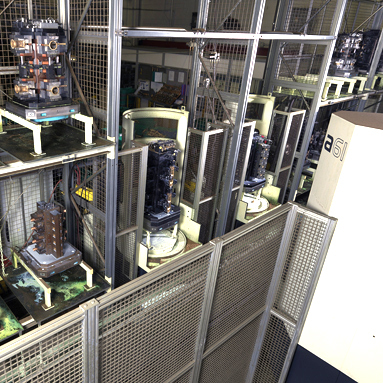 The first MMC2 system was installed in 2010 and incorporated two existing Makino horizontal CNCs. The installation was well organized and timely. The flexible manufacturing cell went into use quickly and was set up as a work cell for one operator. The much-debated value of added flexibility was now settled. Though hard to quantify in advance, the daily and hourly benefits of a flexible build capability were now clear to everyone in the organization. The discussion shifted from “if” there would be a benefit to how best to capitalize on the improvements. One clear benefit was a reduction in direct labor content. Although cycle times had not changed, the efficiencies of a multi-unit work cell and greatly reduced setup times created an environment where the operator could make better use of their time and experience fewer delays. The next big step in 2012 was the installation of a second MMC2, adjacent to the first unit. 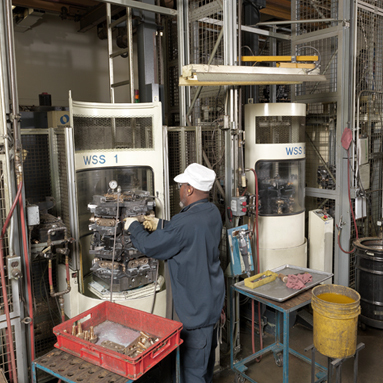 This machine shop “city” brought together the many production elements that previously were spread all over the plant into a compact, efficient space. Everything needed for efficient machining was now in close proximity. This effort required machine-shop leadership to alter operator expectations and practices. For example, some items had a lathe operation in their routing because essentially that’s the way it had always been done. 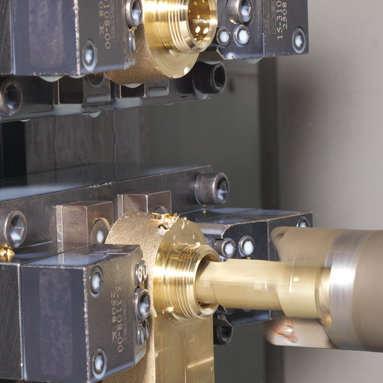 But in fact, much of the traditional lathe work could be accomplished on the horizontal CNCs with the proper tooling. The issue was less about cycle time than about part processing—effectively combining operations could eliminate a routing step, a major saving in any manufacturing operation. The company was already highly skilled at designing and manufacturing custom tools and fixtures. In fact, nearly 20 years earlier, the company developed, for its own use, a workholding fixture with interchangeable upper and lower fixture jaws. The limitation of the design was that each part required a different set of jaws. 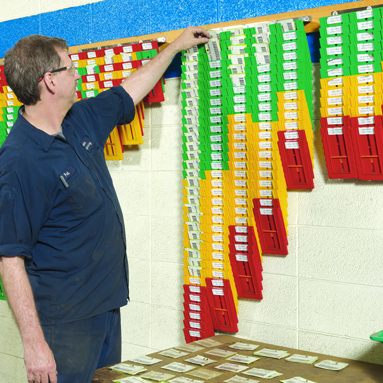 Standardization of production processes extends to the company’s tool catalogue as well. 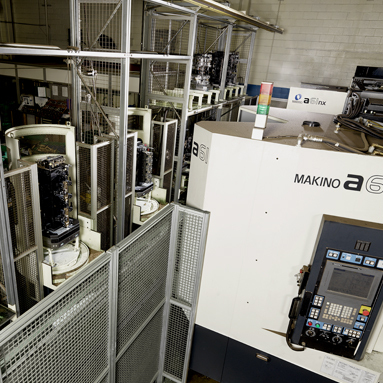 Prior to its investment in flexible manufacturing cells, the company had nearly 300 tool varieties running on the Makino horizontals. 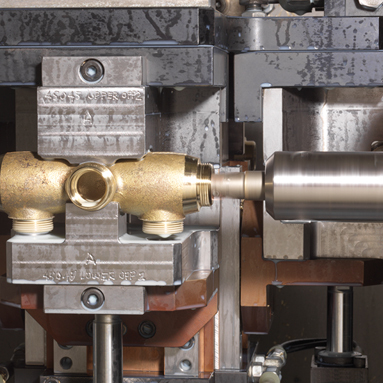 By designing custom combination tooling, Chicago Faucets has since reduced that number by more than 100 and is working to be down below 150 tools by the end of the year. Once at this level, the “standard” tool set can be incorporated into each CNC. Another unanticipated benefit of the Makino MMC2 equipment has been improved workflow efficiency. In a recent example, operators noticed a load imbalance with long runtime and short runtime components between the two cells. This disparity impacted the machine utilization, especially where one or more of the machines is starved for parts, idly waiting. The solution came from a thorough review of part cycle times and a reallocation of parts between the two cells to achieve a more uniform average cycle time. The rebalance has resulted in tangible productivity gains. “Since purchasing the MMC2 systems, we’ve learned that automation is a project with no completion date,” said Hoff. “Operator experiences and automated reporting features are helping us identify areas where we can further improve efficiency. We’re amazed at the long list of small improvements that add up to big gains in productivity. Within the last year, Chicago Faucets has deployed a barcode-based order-tracking system generated with its ERP system to monitor and react to customer purchases. This software supports the closed-loop system for product manufacture and assembly from casting to final order delivery. “Within minutes, we now see customer demand [consumption] and can react quickly to large increases or decreases,” said Schlessinger. “The MMC2 cells are at their best in this environment because they can provide both flexibility and horsepower we need to mirror output with demand. When we need to be aggressive about producing high volumes of a few parts, we can. When we need to produce a wide variety of low-volume parts, we can. These capabilities work seamlessly with our order-tracking system. An integral part of these improvements is the company’s tool and die department, which supports the flexible manufacturing cells. Rick Straszewski, tool and die maker at Chicago Faucets, discussed the department’s recent acquisition of a Makino PS95 vertical machining center that has helped the company increase capacity for casting development. Of the new features available through the PS95, the tool and die department expressed particular appreciation for the machine’s through-spindle coolant technology. Straszewski and others have used this feature to improve the production of straight through-hole features, eliminating previous pecking operations for faster production. In one corebox component, cycle times were reduced more than 50 percent. The efficiencies gained through automation have helped Chicago Faucets compete effectively with offshore producers. The company has adapted to globalization by improving speed of response, flexibility and labor-to-equipment ratios. “We can’t compete on hourly wages, nor do we want to,” said Schlaefer. “We’re proud of the dedicated, long-tenured employees at this plant. They make a good living, and the company benefits from their focused contributions every hour of every day.